I was at Toy R Us and saw the funniest toy ever - Mr Potato Head as Spider-Man. Hey kids, it's the amusing Spider Spud! Yes, I think it's even funnier than Darth Tater. 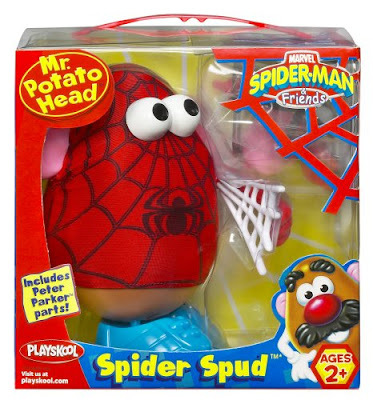 Spider Spud is a tie-in with the upcoming Amazing Spider-Man movie reboot. This new toy is also a reboot. There was another Spider Spud that came out a few years ago. The new one looks much cooler. My birthday is next month (hint, hint) and I hope not to get any more socks. My Spudey sense is tingling.